With just a pair of hands and two fingers you can save a life: a fact that emphasises the necessity of taking swift action when someone is suffering from sudden cardiac arrest. This was the subject of a press conference and subsequent demonstration classes which took place at the Hospital Clínico last Thursday, led by hospital general manager, José Antonio Medina. Simply giving a cardiac massage, which is rhythmic compression of the heart, and providing air mouth-to-mouth could resuscitate up to 30 per cent of people suffering from cardiac arrest. 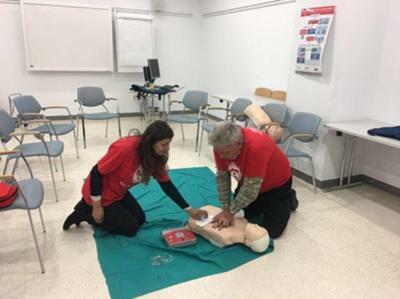 This figure then increases to 50 per cent when a defibrillator is employed no later than six or seven minutes afterwards, according to Ángel García Alcántara, a specialist in emergency medicine who also teaches CPR and how to successfully use the defibrillators which are provided in public spaces. Therefore, in theory, the estimated 30,000 deaths caused by cardiac arrest which occur in Spain each year, 1,000 of them in Malaga, would be reduced to 15,000 if defibrillators were used in time. When defibrillators are not available, a person suffering from cardiac arrest should be placed ontheir back and the head should be gently tilted forward to help open the airways. The person giving the CPR should call an ambulance immediately and in the meantime perform a cardiac massage on the lower half of the breastbone to help encourage blood flow to the brain. Most heart stoppages are caused by a severely irregular heartbeat, also known as ventricular fibrillation, or v-fib for short, which causes the heart's lower chambers to quiver, preventing it from pumping any blood. The electric shock of a defibrillator helps to restore a regular heartbeat, which is why the use of the machine is imperative. CPR, in addition to potentially saving a life, reduces the chances of the victim suffering further consequences, such as brain damage, but it is estimated that only one in five victims receive it. Nevertheless, the provincial director for the 061 emergency service, Paloma Rosado, revealed that in the last ten years there has been an overall rise, from five to 18 per cent, in the number of witnesses providing CPR at the scene. This is perhaps due to the increased availability of classes such as those held at the Clínico Hospital, and the increase in life-saving knowledge among the public. The director of the intensive care unit at the hospital, Dr. María de la Torre, explained why it is essential to act fast. She stated that for each minute that passes after the attack, the chance of survival decreases by another ten per cent, so that by the fifth minute the risk of serious repercussions, or death, is very high. The classes at Hospital Clínico will be repeated on a Saturday once every month. They are free of charge and open to anyone who wishes to take part.